Happy New Moon! This week starts off with the New Moon in Aquarius which hits precision on Monday, February 8, 2016 at 9:59 am ET. For the past few weeks most of the energy has been related to the planets in Capricorn. With Pluto in Capricorn, the changes we are going through collectively and individually are potent and powerful. The recent visit of Venus with Pluto encourages all of us to make a change in how we relate to our body and the earth. Money and establishments have been an important issue since the beginning of 2016 with Mercury retrograde in Capricorn and the strong emphasis of Plutonian energy we’ve been dealing with. 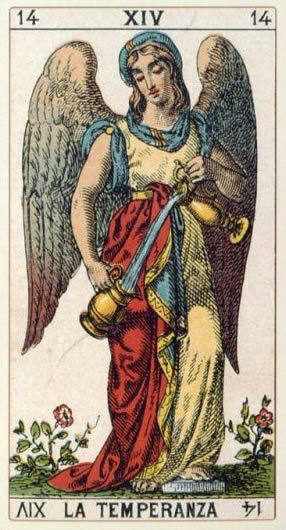 Uranus is the ruler of Aquarius and is represented by the Fool in the tarot - freedom and new beginnings. Uranus has been in a long-term connection with Pluto that puts emphasis on our personal need for freedom vs. old patterns we’ve been stuck in for long enough. On a larger scale this also includes seeking freedom from the established norms of society that we’ve outgrown. We are collectively going through major transformations individually and collectively. Though these larger issues of politics and the economy will continue, I won’t be talking much about that this week, as the past few weeks have been focused on such issues. Astrology speaks to the whole spectrum of human experience. Now, we are now focusing on a more optimistic way forward. We’re aware of what is, and now it’s time to start taking a new approach. With the New Moon in Aquarius starting off this week, we are looking forward with hope and planting seeds to create the vision we want for our lives. Hopefully, over the past couple of weeks you’ve been able to tap into the Plutonian energy, and purge a lot of the unwanted aspects out of your life to make room for the new energy we are granted now. Capricorn is about where we need to do the work to achieve a strong foundation and stable footing. Aquarius is about making a difference in bigger ways, finding solutions and breaking free from what holds you back. We are now ready to move forward with inspiration and optimism, away from the limits of traditions and towards new ways of thinking. Aquarius is the important step towards higher consciousness where we recognize ourselves as part of the collective. Your unique voice that inspires the world around you is called for. Now that we have technology, each of us has the ability to reach around the world instantly. Our individual thoughts and ideas are more free than ever to reach out and touch the collective. Mercury, now direct, will be leaving Capricorn later this week and entering Aquarius on Saturday, February 13, 2016 at 5:43 pm ET bringing a new way of thinking forward. So between Monday and Saturday, Mercury will be finishing his visit with Capricorn this week. The way we are thinking about what we want to achieve will continue to transform and change this week. New creative and inventive ideas will begin to formulate more quickly as we finish off this week and head into next week. Pay special attention to the books, messages, articles, informative programs and insights that have been showing up for you in the days close to this New Moon in Aquarius. Make notes and see which new ideas you want to focus on more to encourage your growth and learning in the subject matter that captures your interest as we go forward. Aquarius is about sciences as well. It is where we ask questions with the intention of moving beyond what we thought we once knew, moving beyond traditional thought, towards freer thought. We have a couple of other notable aspects happening this week as well. Venus in Capricorn is in harmony with Jupiter in Virgo on Wednesday, February 10th. This puts extra emphasis on the earth element. This can show up in our lives in a few ways. In love, bonds can grow immensely, and physical connection becomes more important. The appreciation of beauty increases significantly. If you have body image issues you could find that practicing looking in the mirror more and appreciating the gift of your physical self as it is, deserves to be honored and respected. More gratitude for your physical incarnation, and the incarnation of others is recommended. Having a clean, organized, beautiful, and harmonious environment in your office and home becomes more important as well. Hopefully you’ve had a chance recently to tap into the Pluto energy with Venus nearby so you can get rid of any junk and clutter in favor of a more organized space for better energy flow and harmony. The symbol of Venus is a circle, representing the soul, above a cross, representing matter and the material world. This symbol resembles a hand mirror. It is a symbol of beauty, but so much more. Everyone has a different relationship with mirrors. Some want to avoid seeing their reflection due to poor self-image issues, while others are obsessively looking at the superficial, externalities of makeup, hair, and the like. How many of us actually really see ourselves in the mirror? How many of us take the time to look deep into our own eyes and see beyond the judgment and opinion of the material aesthetic and go deeper to look at who it is that exists behind those eyes? A long, healthy look at yourself, your physical surface and the deeper self behind those eyes, is a good practice this week. Jupiter encourages us to see more of who we really are now and to recognize the deep wisdom of life within. This is a great time to transform your relationship with yourself with more loving eyes. The Star card in the tarot represents Aquarius and we see the woman pouring water into the reflective surface of the water, representing our collective consciousness and our mirror. In the Rider Waite deck we see in the sky of this card’s imagery the stars are laid out in the formation of what some say resembles the hand mirror symbol of Venus hearkening to the power of Venus, the Goddess of Love and the Divine Feminine. Love can permeate all we do. This can be a highly important time for artists. Venus rules beauty and the arts. When you practice creating art, it reflects back to you who you are. Creating art has us realize the many aspects of ourselves. It reflects our fears and inhibitions about our abilities, our patience with ourselves or lack thereof, our stamina and our ability to be free to explore and play. Creating art brings out our emotions that may have long been locked away. In the practice of creating art we see where we need to grow in our skills, but more importantly in our emotional selves. Though the art created is important for the observers experience, what is more important as the creator of the art, is the process of self discovery we experience in the process of its creation. Art is like a mirror that shows us who we are on deep levels. Art is an act of discovery, trust and can be an effective form of therapy. Mars in Scorpio and Jupiter in Virgo are in harmony on Saturday, February 13, soon after Mercury enters Aquarius. Willpower and determination get a positive boost later this week. We are more likely to be inspired by wise ideas. We are more likely to make discoveries that lead to a more philosophical outlook on life as well. Whatever you are interested in learning can lead to exciting realizations this week. Meditation and practices in deep inner reflection can open new vistas that get us more excited about life. This can be a great time to start a new exercise program to amp up your energy levels. It’s a great time to create a plan of action with a purposeful outlook. An inquiring mind and an investigative, resourceful approach can stimulate your passion for bigger possibilities. Overall, the New Moon in Aquarius sets us up for hopeful new beginnings we all get to grow into over the next couple of weeks. Venus is an important power player this week along with Jupiter, encouraging us to allow love to transform our lives in big ways, inside and out. Loving yourself is pivotal in helping to change the world around you. Mercury heads into Aquarius at the end of the week, adding more emphasis to our most inventive, solutions oriented thinking. Any futuristic, sci-fi movies that get you to think outside the box are recommended now. Cosmos with Neil deGrasse Tyson, a remake of the original Cosmos by Carl Sagan, is available on Netflix. This is a great choice to expand your outlook. It also demonstrates how new discoveries conflict with old, established thought patterns, which is in tune with the transition of focus of energy from traditional Capricorn to freedom-loving, innovative Aquarius this week. If you have personal concerns that you'd like to have insight into or if you're interested in what the coming year holds for you, I would be happy to take a look at your personal astrology chart and cards to give you insight and ideas that speak directly to your circumstances. Aries: Who you see yourself associating with is changing this week. It is those that you want to be a part of your future that come into focus for you now. Growing those relationships that give you optimism for what’s possible is recommended. Going out to enjoy what life has to offer, seeing a sci-fi film at the theater or reading a futuristic themed book is good for your sense of well being now and can spur creative ideas. Your goals are asking you to put a plan into place this week. Putting extra energy into getting organized and on track with work and health matters does you good. A growing need for renewal can feel emotionally poignant by the end of the week. Taurus: The arts are calling you. Whether it is appreciating the creative works of others, or trying your own hand at creating something beautiful, the inspiration to grow your concept of the arts wants your attention.You are likely to appreciate the work required to create something that you find beautiful. Where you are not satisfied helps you to try new approaches.You could have a breakthrough week that has you feeling more positive and philosophical. Wisdom finds you. This New Moon has new goals written all over it for you. Plant the seeds now towards the future you envision for yourself. Your ideas about career matters are likely to develop significantly over the next couple of weeks. Think outside the box. At the end of the week, it’s time for “me-time.” Some self care is on the menu. Gemini: The New Moon starts off the week encouraging a more philosophical outlook of your life. This can include you thinking more freely for yourself rather than accepting or agreeing with what others tell you to think. This is a trend that will continue to develop for you and will be further enhanced later in the week when Mercury enters Aquarius on Saturday. Researching topics early in the week can expose you to new discoveries that can be foundational as part of your new outlook that is set to further develop even more next week. If you have financial issues to deal with, particularly debts and loans, this is a great week to get all that figured out so you can move on with less of that lingering on your mind. Set yourself up for success. Cancer: The New Moon kicks off this week. You are likely to have increased intuitive abilities, and perhaps even premonitions about the future. They could show up in your dreams, but it’s more likely to show up when you are awake. Daydreams and flashes of insight can arise out of the blue. Your relationships are changing, mainly because of how your thoughts are changing. How you communicate with others has the ability to open doors this week. An optimistic attitude, a wise approach, and intelligent conversations can strengthen bonds. Words you speak now, and messages you convey through body language go a long way. Inspiration can arise quickly when you’ve got your curious cap on. Leo: Do you see a bright future in your relationships? This New Moon enhances the importance of people in your sphere, particularly those you deal with one on one and in close connection. Whether it is romantic, platonic or business, each relationship you have requires a new, unique approach that helps align your life to the vision you hold for your future. Focus mainly on relationships that you hope to grow most over the next couple of weeks - those that you feel are most connected to the hopes you have. Those that are most receptive and listen to your ideas are your best bet. With money matters, work and daily routine emphasized this week you’ll feel most satisfied when you are pouring love into your goals. When there is love in what you do, it helps you along the path to your success. An open mind and an optimistic outlook help give you the energy to develop a stronger, more secure foundation and also helps you attract good luck. Virgo: You’ve got a lot of positive energy in your sphere with Jupiter in your sign, and Venus is sending you her love. Dabbling in the arts can give you an all new perspective on your potential. Going to see a show, whether it’s a musical performance, a play or a movie, can change you this week and open up your mind to new ways of thinking and perceiving yourself and the world. The New Moon is asking that you start an all new routine and change your lifestyle. Health and wellness are growing in importance for you over the coming weeks and this is just the beginning. Positive emotions and inspired words are your starting point. They will help lead the way in helping you getting more in touch with your body and mind in healthy ways. A new meditation practice is right up your alley. Libra: This is a great week for you to get inspired to begin an all new creative endeavor. Whether it is conceiving children, creating a work of art, or simply being an active observer of entertainment and the arts, there is new energy available to you that can inspire hope and positive changes in your life. You could also have dreams that instill new faith in the world. The love of family or those close can give you a feeling of blessings that are beyond words.The way you think and feel about people in your immediate circle can change for the better this week. Knowing that each person is a part of your destined path, helps you make sense of life. There is a spiritual, philosophical energy with you this week that can warm your heart. Love really can make everything better. It is a goal worth pursuing. Scorpio: It’s the people that you socialize with that can bring you great blessings this week. This is the time to talk more, get out more and own your personal power. A sense of confidence in who you are helps you to more easily connect with others. The interactions you have now can teach you much about how to grow relationships for the better. A fresh beginning with home life is suggested. The New Moon asks that you create better energy flow and more freedom in your personal space. Welcoming new people in your circle or family dynamic is likely for many Scorpios now. By the end of the week you should feel like your relationships are more solid. Sagittarius: The New Moon sets you up for new ways of thinking and sharing your ideas. There’s an element of genius in the air. Innovative thought can kick off new beginnings for you that lead you towards a brighter future. Getting your goals and intentions for your career in order this week is blessed by good fortune. Smart ideas are your best step to manifesting big changes for your life this week. Money matters look blessed. This could be a good time to ask for a raise, or to launch a new product or service if you’re an entrepreneur. The main thing getting in your way is your confidence levels. If you can overcome doubts, and put your best foot forward, you’ve got good luck on your side. Your unconscious motivations can help put you on track. Trust your gut instincts to guide you. Capricorn: Well it’s been a busy few weeks with so much happening in your sign. Your finances and your sense of security are coming into focus. A new, more positive approach in money matters going forward is called for. Your intuition is going to get a growth spurt this week helping you to make smart decisions that help you create a more solid future. Self-worth and self-love are transforming who you know yourself to be. If you can share that love you are developing for yourself now, with the world around you, you will attract good luck. Learning from other cultures and giving yourself a taste of a more philosophical outlook expands your view of the world. Having faith in yourself, trusting the processes of life, and exploring the opportunities the world has to offer is an important part of your learning now. Aquarius: Happy New Moon in Aquarius. This is your birthday month and the New Moon gives you a boost to new beginnings. This is when you get to reflect on and admire the bright light that shines within you and through you. You get to initiate changes that have sweeping effects on your future. There is always an infinite amount of love to draw on from the universe - knowing this can empower you greatly now. Gratitude and faith in the process of your life helps you to tap into unseen blessings. It is when you hold love in high regard that you attract more opportunities to manifest a more magical life. Your thoughts and words hold greater power as we progress further into the week. Pisces: This New Moon can be a bit quieter for you. Your dreams and daydreams can lead to new ideas and inspirations that seem to come from another world. Trust those messages, as they can bring fresh starts that make a difference for your future. Your social life can lead the way to blessings in your life this week as well. You could meet someone that you feel you’ve known for a long time and it can feel karmic. Partnerships are blessed this week, especially romantic and passionate interests. A candlelight dinner on the weekend is the perfect choice for stoking the flames of romance. A desire for adventure can do wonders for your relationships.